There is nothing in sports quite like a sad-sack franchise making good for a tortured fanbase. The scenario begets bonus points if it involves a city which had previously lost its team, only to watch it return in glorious hell fire after writhing in self-imposed exile. 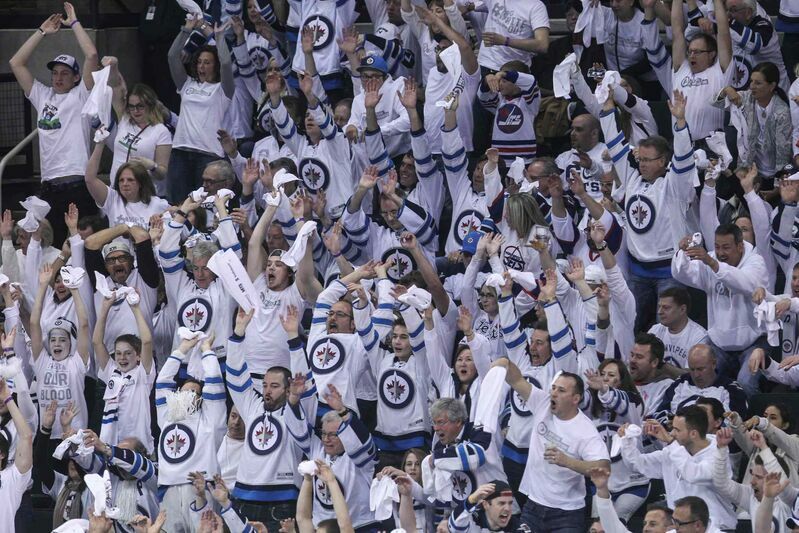 For fans in Winnipeg, simply having playoff hockey return was cause for exuberant celebration. An extremely abridged history, with aid from Wikipedia, for the sake of context: Winnipeg first received a professional hockey team with the WHA in 1972. Behind Chicago Black Hawks legend Bobby Hull, the WHA Jets were outstanding, winning three Avco World Trophies as playoff champions (and being runners up on two other occasions), including winning the final one against a young Wayne Gretzky and the Edmonton Oilers. Along with a few other refugees, that team joined the NHL in 1979 after the WHA folded due to financial concerns (financial concerns would haunt this first incarnation of the Jets). From the time of the first WHA reclamation draft, the Jets were kind of screwed; they finished dead last in their first two NHL seasons, and although the team drafted competently enough to make playoff runs for the better part of the next decade, they were never serious title contenders. In 1996, the Winnipeg Jets closed up shop and shipped off to Phoenix to become the Coyotes. On the flip side, the NHL had awarded Atlanta an expansion franchise in 1999, despite the previous one, the Flames, moving to Calgary back in 1980. Even with the insane scoring touch of one Ilya Kovalchuk to aid them along, the Atlanta Thrashers made only one playoff appearance in twelve years. In 2011, everybody collectively decided they’d had enough of the Thrashers, and that Winnipeg deserved another shot. Thus, like the legend of the phoenix, the Jets were reborn. At first, having hockey back was enough. 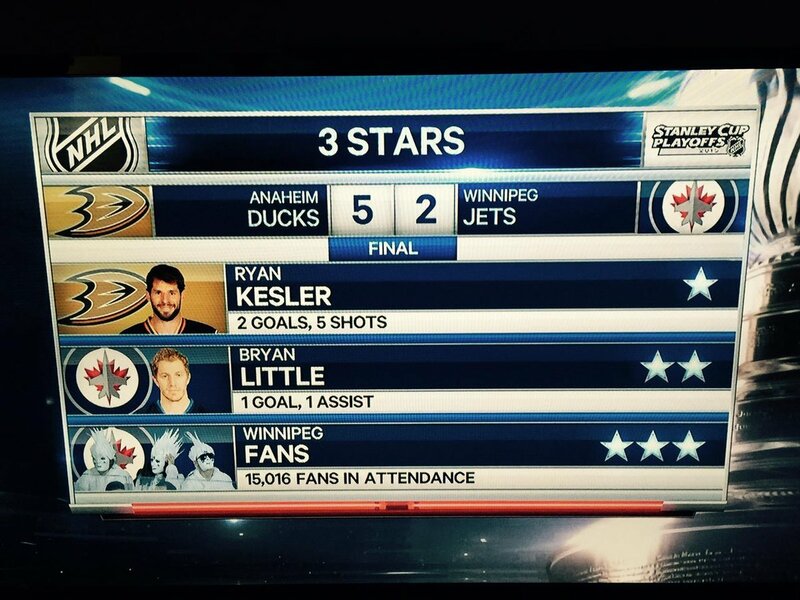 As always happens, however, after a certain period, Winnipeg wanted a taste of the postseason. This year, for the first time since the team returned, the Jets were in the playoffs. Winnipeg fans rioted when the team clinched its berth. Madness, that born of generations-deep pride, enveloped the streets. They would play the top-seeded Anaheim Ducks, a team whose fanbase is one of the more incessantly apathetic in the NHL, even after having won the Stanley Cup in 2007 and consistently putting out one of the best teams in hockey over the last decade. The Ducks easily disposed of the Jets, which I suppose is the most important thing, but in the grand scheme of these playoffs, what we’ll remember from this series is how Winnipeg received and treated its star-crossed squad. When the series returned to Winnipeg for Game 3, the first playoff hockey in the city since 1996, the team decided to return to a franchise tradition: the Winnipeg White-Out. In full force, seemingly the entire city arrived outfitted in its nicest Sunday hockey attire, prepared to support its team, regardless of the consequences. The Jets lost Game 3 in overtime after leading 4-3 late in the third period, and that was that. Game 4 offered little in the way of relief; upon seizing the early lead, the Jets gave up a tying goal almost immediately, and any momentum they could’ve carried into the second period was lost. Anaheim went ahead and never looked back, despite surrendering a Winnipeg goal which drew the score to 3-2. Anaheim slotted two more into the net, winning the game 5-2 and sweeping the series. Toward the end, the scene called to mind that of the Republic of Ireland supporters watching their soccer team flounder against the dominant Spain side at Euro 2012. Ireland, a relative butter knife in a drawer full of machetes, lost 4-0 to the defending world champions, but that didn’t stop the Irish faithful – in sports, fans are always “the faithful,” even the most pessimistic dregs among us – from singing “The Fields of Athenry” to their boys in green, long after any hope of moving forward had died, appreciative of the opportunity to travel to Poland to stand among the world’s best. For their troubles, the Irish were named the best fans of the tournament. Winnipeg had similar chances to advance against the Anaheim Ducks, and those expectations were met firmly, like watching a crash test in slow motion. No matter. The Jets will return, and their fans will be there to cheer for them, cognizant of the luck, and the faith, which has afforded them a second chance at hockey glory. Amen.